Non-Applying Parental Consent-Form DS-5525 The DS5525 is the parental consent application form for anyone who is applying without one of the child’s parents. Name Change-Form DS-5504 Name change form is used when applying for a new or renewing an existing passport and you have recently been married or divorced where your name has recently been changed. New Passport-Form DS-11 DS11 Application Form is used when applying, for a new passport or your passport has been expired for more than 15 years. Child Passport-Form DS-11 A child passport is only valid for 5 years. This passport cannot be renewed you will always need to use the DS11 for New Passport Form. Renewal Passport-Form DS-82 DS-82 Application for Passport Renewal is used your passport has expired an need to be renewed. Statement of Consent-Form-DS-3053 Statement of Consent-Form-DS-3053 is used when applying for a child passport and have a special circumstance. Stolen Passport-Form DS-64 DS-64 is used when reporting your passport as lost or stolen once you submit an application DS-64 this notify the government that your passport is lost or stolen. Additional Visa Pages-Form DS4085 You are no longer able to apply to add visa pages to your passport. Passport Photo With any passport application, you will first need to obtain a recent passport photo. Most forms come with complete instructions. You should read these before completing the forms. Many of the forms can be filled out electronically via a third party but then must be printed for submission. The forms are color coded. Please be sure to compare the photos of the forms below to the form you use. The DS-11 Application is for U.S. citizens who need to get a new passport, or a passport that was stolen, lost and/or expired for more than 5 years. The State Department has made changes to the application form where the applicant can now fill out the form, and download a bar coded copy of the application DS-11 form. The DS82 Application is for U.S. citizen who needs to obtain a passport renewal form. This application form is only used for adult passport where the passport has not been expired for any more than 5 years. The DS3053 Application is for Parents of U.S. citizen who would not be able to present their children passport application to the passport agency. This form would need to be signed and notarized to be present to the passport agency. The DS-60 Affidavit of Change of Name is required when submitting a passport application with the following issues (1) your name is different than what is shown on your proof of citizenship or (2) has changed without court proceedings, and was not done by marriage. The DS-64 Application is used when you have lost a valid passport book and need to notify the State Department that you passport book has become lost or stolen. This form is required if you need to obtain a new passport using the new passport form. 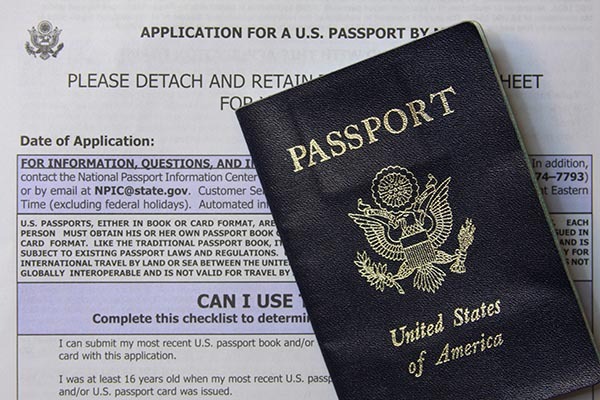 The DS-4085 Application is used when you need to add more pages to your valid passport book. This is a short application where it’s just one page long. The DS-5504 Passport Form is used when you need to change the name and fix errors in your passport book. This application form newly married couples and anyone who was divorced and would need to update the passport with the correct name. The DS-5525 Statement of Exigent/Special Family Circumstances is an application form for non-applying parents who are looking to obtain a passport for a child where the other parent/guardian consent could not be obtained. Hello, it will be a DS 82 renewal app and on the DS 82 app you will select passport book, along with all renewal documents, such as the current passport card, passport photos and passport fees ($110) and any original/certified copy name change documents then you will mail everything in directly to the US Department of State, address listed on your DS 82 app. Also it would not hurt to send a letter stating you still plan to use the valid passport card and wish for it to be returned. I made a mistake on the online application form that I didn’t notice until I printed the form. Can I use white out on the application to fix my mistake or do I need to fill out another form online? I have a passport card Canada, Mexico & Carribean yet pplan on traveling to isreal soon what forms & Fees & anything else do I need. Hi, can I pick up the form DS11 at the Taunton post office or do I need to print it out myself? I am getting my first passport. I was wondering if I need to bring in my social security card to get one or if I just need the number. hey if one parent doesn’t have a valid drivers license what documents (number total) do they need to bring to show parental relationship? My son had his passport taken when he was 15. He’s now 25. Does he new a renewal or new passport application? please call 877-487-2778 and speak to the US Department of State directly. It would be good if whomever wrote the above information knew proper use of grammer. i just whodorenewed my passport. i sent them my marriage certificate for my name chanfge, but thye havent done the change neither send me back my marriage certicicate, i got the renewed passport with the aame name.who do i contact? I sent a renewal application to the National Passport Processing Center in Irving Texas on 8/21/17 via US Mail (Priority Mail). I was told to check on its receipt after a couple of days. I did call but was told to call again after a couple more days. If possible, could the Passport Renewal Office let me know by email whether or not my application arrived? donovan111939@gmail.com. Thank you. Hello UPS couldn’t deliver to the PO box used by the National Passpwort Processing center in PA. From the tracking, it looks like my renawal package got sent to Newark, DE. How can I confirm that my passport ended up here or at one of the renewal facilites? And can it be renewed the same way here as it wold of been in PA? Does my mailing address on my passport application have to match my license in order to be mailed? Hello, what is your zip code? I need to make an appt to apply for a passport at the Bexley office. How can this be done when no one answers the pnone? I need my passport in two weeks. Do i need to expediate the process?